Part: # 49499 Size: 8 oz. Purchases made through unauthorized Third Party Retail sites such as AMAZON.COM & EBAY. COM will VOID ALL GUARANTEES and/or WARRANTIES associatedwithBlueDevilProducts. Ifyouhavea question or concern about your online purchase please call 1.888.863.0426 before ordering. 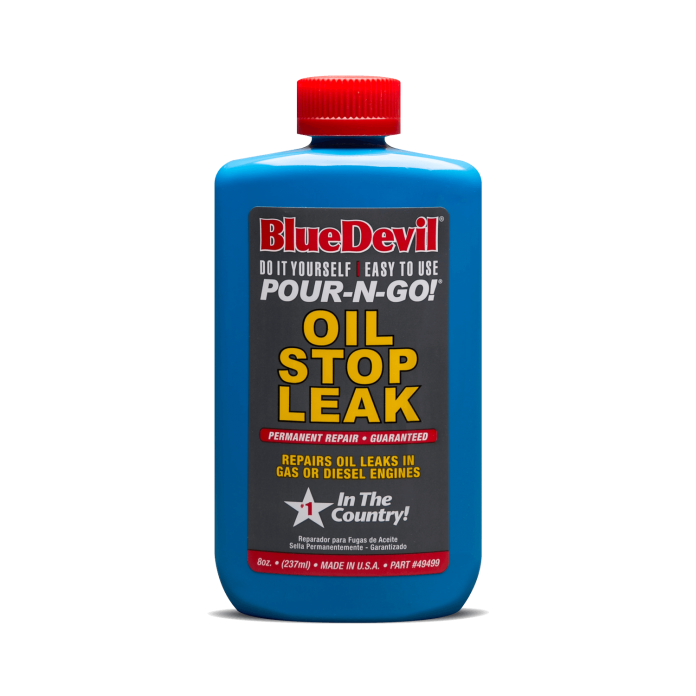 BlueDevil Oil Stop Leak seals engine oil leaks permanently. It is non-clogging and will not harm your engine. BlueDevil is safe and easy to use and is compatible in gasoline or diesel engines. It’s guaranteed or your money back. BlueDevil Oil Stop Leak is an oil leak sealer that will stop leaks permanently. Pour 1 bottle (8 oz.) into leaking component’s oil sump, or crank case. Treats 4 to 6 quarts of motor oil. Start engine or equipment and operate for 1 to 2 hours or until leak has stopped (for extreme leaks up to 2 days drive time may be required). Use this product for: pinion seals, gear cases, refillable shock absorbers, gear boxes, axle seals, and gear differentials. DO NOT USE IN BRAKE SYSTEMS OR ON PAINTED SURFACES! CAUTION! Avoid contact with skin. Keep out of reach of children. Always use protective eyewear. I had a couple leaks on my 94 BMW 525i. Car has 265k it would leave 5 or 6 big drops overnight. After 1 bottle and a few weeks it is now 1 small drop or 2 over night. That alone to me is worth it. Haven’t had to top up oil since using the bottle. I contacted blue devil who is very easy to get a hold of and they promptly shipped me another bottle free of charge recently which I haven’t had time to receive. I’m sure another treatment will do the job as others have also said. My car takes 7 quarts of oil and it treats 4 to 6 quarts so that may have been a factor. The customer service alone is enough for me to be satisfied. Thx again! 1987 Toyota Supra 7MGE engine.Using about a quart of oil every 2 weeks. My 1949 tractor was leaking oil considerably. After using BlueDevil, my leak stopped completely and my tractor is running better than it ever has! Heard so much about this product online, and just put this in my engine hope this works! Review update. Got the second bottle to retreat my car free of charge. Didn’t even have to pay shipping. My car no longer leaks any oil. Sometimes it takes a second shot. I geuss but I can say it. Works. Save me well over a grand and alot of headaches. Thanks again blue devil! BlueDevil is a permanent repair! BlueDevil Oil Stop Leak works while you drive. BlueDevil absorbs into the seal to soften, expand & revitalize the size and flexibility to its original condition. How large of a leak does it repair? BlueDevil will seal leaks in any fluid systems that are seeping or dripping. One bottle treats 4 to 6 quarts of motor oil. 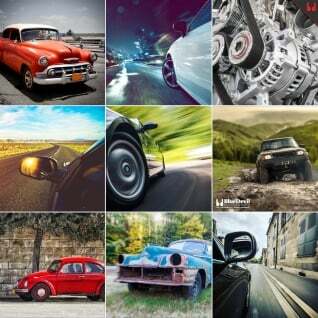 Start engine and drive vehicle or equipment to let BlueDevil circulate. The repair is sealed while you drive (up to 2 days drive time). YES. BlueDevil does not contain petroleum distillates, which can destroy seals after temporarily expanding them. It is safe to repeat treatment if other seals leak in the future.